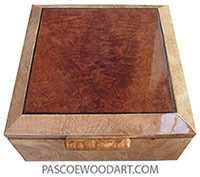 This box is of an exceptional piece of Sapele veneer obtained commercially and is of standard veneer thickness laminated over a cherry core with box ends of curly maple for contrast. 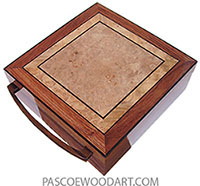 Sapele comes from equitorial Africa. 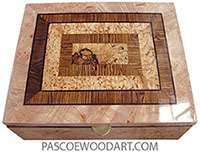 In bright light this box displays an extraorginary grain pattern and is highly prismatic. Lid has an ebony handle and is stayed with a brass chain. Last updated January 11, 2011. Posted January 09, 2011.